Burney called him ‘a very pleasing composer’, while La Borde speaks of ‘a particularly graceful style, concise and energetic arrangement of the parts, and new ideas’. Neefe described him as ‘a light, agreeable and lively composer, whose counterpoint is cleaner than that of many of his countrymen’, Leopold Mozart liked to use one of his harpsichord concertos when teaching. 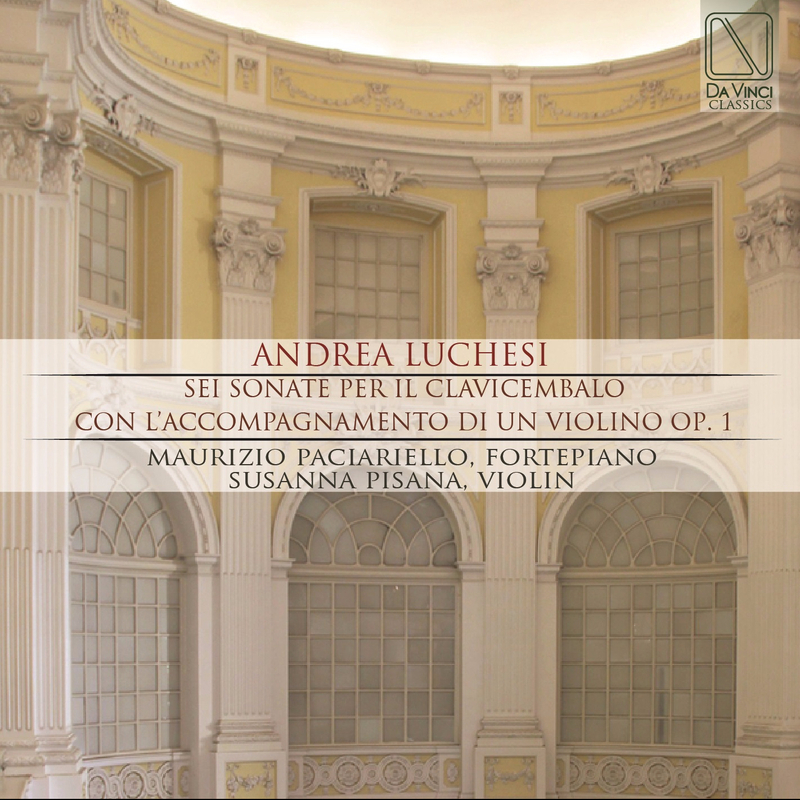 The interest towards Luchesi during his whole life is not little, especially if compared to other composers that never had the fortune to have, at least, a direct quote from such a scholar. By the way, the quotations are nothing if there is no fact and evidence and luckily the music survived is enough to give us an idea pretty correct about his style and why he was so admired and respected. Andrea Marcelli native of Rome, Italy, drummer, clarinet player, composer, producer. During the last 35 years of his music career Marcelli performed successfully in 5 continents. He recorded many CDS and two acclaimed solo CDs for legendary Major Jazz Label VERVE/PolyGram with his original compositions . Also collaborated with Columbia Tristar, Polydor K.K., ESC-Medien, BHM, Soul Note, Jazzwerkstatt, Storyville, 55 Records and others. Over 200 of his compositions, Jazz or Soundtracks, have been recorded on CDs. Two of his tunes, from his album “Beyond the Blue”, have been included on both the prestigious “European Real Book” and “The Digital Real Book part 2” by Shermusic. He is leading a very active musical life performing world-wide in: USA, Japan, India, Brazil, South Africa, Tunisia, Hong Kong, China, Indonesia, Lebanon, Zimbabwe, Mozambique, Russia, Norway, Denmark, Sweden, Finland, Poland, Estonia, France, England, Spain, Italy, Germany, Luxembourg, Belgium, Holland, Lithuania, Romania, Portugal, Czech Republic and others. Andrea Marcelli started his career in Rome as freelance drummer playing, as side-man, many TV shows for RAI Italian Television, from 1982 to 1988 mainly with the Big Band of Bruno Biriaco. He graduated at the Conservatory L. Refice of Frosinone, in 1986 in Classic Clarinet and Jazz Compositions/Arrangements. From 1984 to 1996 Marcelli also produced, composed and recorded many soundtracks for television especially for Primrose /Flipper Music. In 1988 he started the production of his debut solo critic acclaimed Jazz Album “Silent Will” that brought him in 1989 to Los Angeles, to be the first Italian Jazz musician to record a solo album for the Label Verve / PolyGram for Japan and USA. “Silent Will” (Verve/PolyGram and Polydor K.K.1989/90) together with jazz legends like Wayne Shorter, Allan Holdsworth, Bob Berg, Mike Stern, John Patitucci. This album was followed by his second successful solo Jazz Album “Oneness”(Verve/Polydor K.K. Japan and Lipstick (1992/94) Europe / USA with historic jazz soloists like Ralph Towner, Allan Holdsworth, Mike Mainieri, Marc Johnson, Gary Thomas and Mitchel Forman. In 1989 he moved to USA living 8 years in Los Angeles and 4 in New York until 2001 . He gained soon a Green Card as “First preference alien with extraordinary abilities in the field of Jazz”. He was very active as live and studio musician both in Los Angeles and New York Jazz scene, collaborating with some of the most important soloists in the world such as: Wayne Shorter, Don Menza, Bob Mintzer, Mitchel Forman, Eddie Gomez, Allan Holdsworth, Dave Carpenter, Steve Tavaglione, Rick Margitza, Bob Sheppard, John Beasley, Alan Pasqua, Alphonso Johnson, Frank Gambale, Harold Land, L. Subramaniam, Doug Webb and many others. Since 2001 he resides in Berlin, Germany and he is very active in the Berlin and in the world-wide jazz scene both as musicians and educator, collaborating with many cultural organizations from all over the world. Andrea collaborated also with: Ekkehard Wölk, Johannes Fink, Markus and Simon Stockhausen, Eberhard Weber, David Liebman, Thomas Clausen, Jesper Lundgaard, Palle Danielsson, Hiram Bullock, Jeff Berlin, Arild Andersen, Giorgio Crobu, among others. Pisana, Susanna (Violinist) started to learn violin with her father when she was young. She continued studying with Norbert Brainin, leader of the Amadeus Quartet, focusing her attention on chamber music. She has performed in the most important auditorium in Rome (Parco della Musica, Teatro Argentina, Auditorium Foro Italico, Teatro Olimpico, Teatro Globe, Teatro di Documenti), Milan (Pomeriggi Musicali, Teatro dell’Arte) and festivals such as Ancient Music Festival in Urbino, Cantiere Internazionale d’Arte in Montepulciano, Società Barattelli in L’Aquila and many others. She made a thorough study of the philological practice of baroque music on original instruments (she plays a Bernardo Calcagni, around 1740), performing even with the Concerto Italiano by Rinaldo Alessandrini. Thanks to the attention to the performance practice she developed a deep interest in contemporary music, collaborating with the Freon Group and the “G. Petrassi” chamber ensemble. In 2006 she performed on live radio with the Michelangelo Quartet at the Paolina Chapel of the Quirinal Palace, in the presence of Giorgio Napolitano, President of the Italian Republic. From 1991 to 2007 she was a violin teacher and concertmaster at the Folk Music School of Testaccio in Rome.